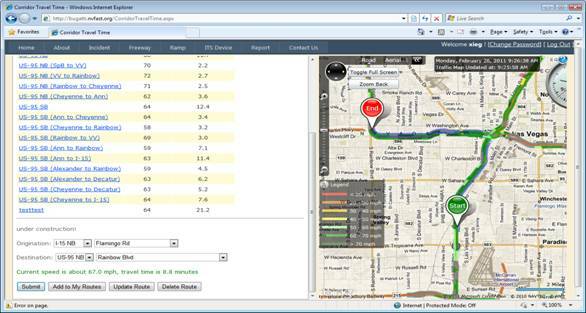 FAST dashboard home page monitors and presents Las Vegas Metropolitan Freeway real time and historical traffic condition through Maps, Daily Peak Speeds, Time of Day Speeds, Average Speed and Congestion Plots from different perspective, as shown in the screenshot below. · Segment and crash is clickable to show detail information. · Freeway performance reliability can easily be observed by the 15th and 85th percentile speed range. · Travelers can choose the best time to avoid the highest peak hour. · Freeway performance improvement can be observed by comparing the speedometers of different time periods. · Yesterday AM/PM peak congestion level can be perceived from the pie charts. 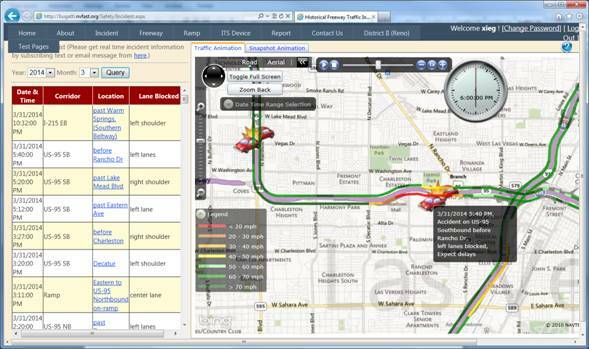 Live traffic map is also displayed on the FAST TMC Screen Wall to monitor and share the traffic & incident information. 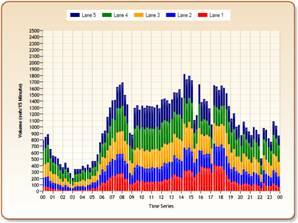 Historical traffic can be animated to review and evaluate the past performance. Every frame is a 15-minute integrated traffic snapshot. · Traffic incident will fly-into its location one hour before its occurrence; Flash during its happening; Fade-out after its clearance to show its residual impact. 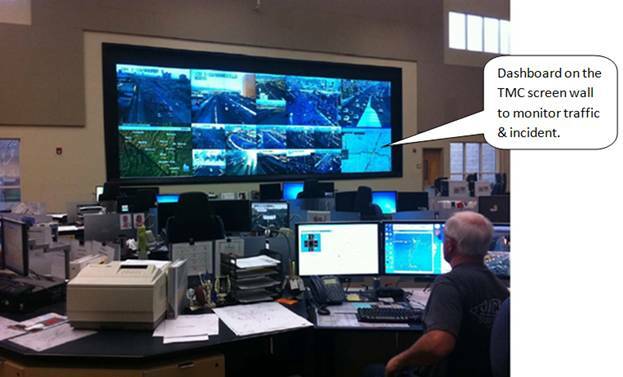 FAST TMC operators monitor and report incidents to the public. Using the Dashboard’s “New Incident” page, TMC operators only need a few clicks on the map and pop-up window to compose and distribute detailed messages to the public. Key information of this incident is recorded, such as lane blockage, tow truck arrival time and lane clearance time, secondary crash or not, and severity. This information is very critical for traffic impact studies, TIM Coalition efforts, and quick-clearance benefit evaluation. The screenshot below shows the interface to add the incident. In just a few seconds, the incident can be added and with lots of key information being logged, and it will immediately show up on the live traffic map available to public. It greatly enhances FAST TMC operators’ quick response to the incidents. The incidents are logged in the Dashboard database. 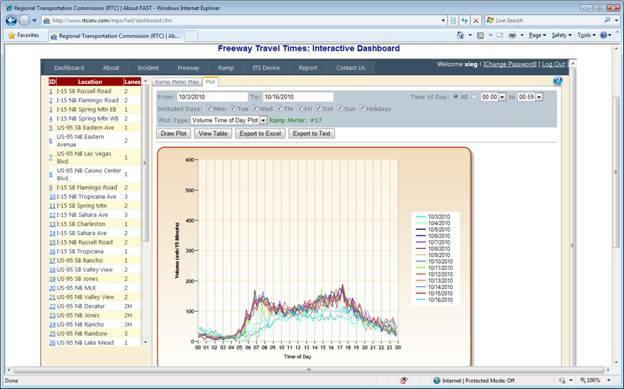 When using the “Historical Crash Analysis”, the key crash information is automatically analyzed spatially, temporally, by severity, and by clearance time. 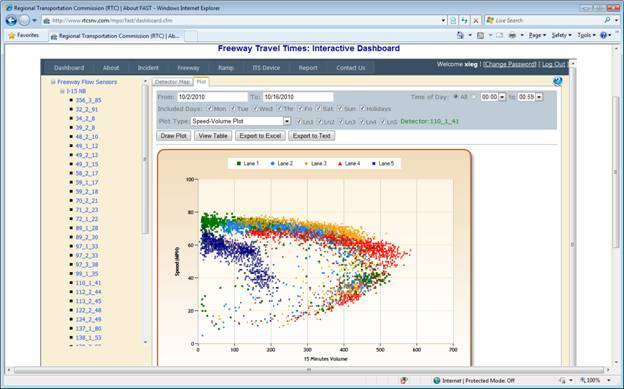 And the results are displayed by various charts, plots, graphs, tables and map. 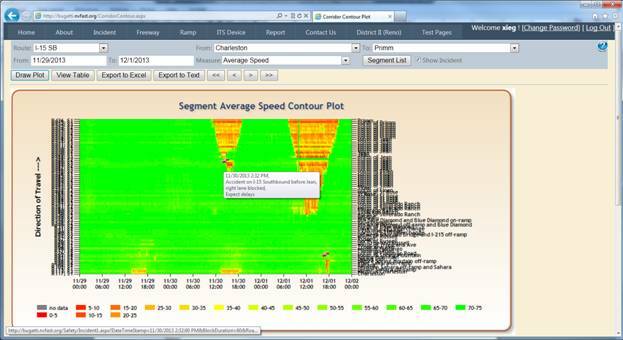 For example, under the spatial tab, the pie charts show the percentages of the crashes by corridor and by workzone. Also the table shows the top 10 crash locations. Under the temporal tab, the crashes are analyzed by day type, day of week, time of day, and peak periods. This page is only accessible to approved users. · How long the queue is and how it dissipates. When FAST TMC operators add an incident, the Dashboard triggers the camera snapshots archiving function. The snapshots are archived at 15-second intervals for one camera downstream of the segment and several upstream cameras depending on the location. Even after the incident is cleared, the Dashboard continues archiving for a certain period of time depending on the severity to monitor how the queue dissipates. This function is extremely useful to evaluate the TIM Coalition’s Quick Clearance Program benefits. 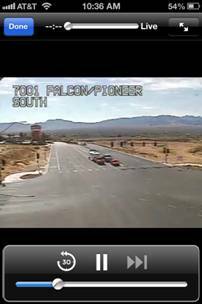 For example, on I-15 NB at Sahara Ave, a highly volatile freeway segment, we have determined that, due to TIM strategies, 35 to 45 percent of incidents are cleared from travel lanes in 10 minutes or less. 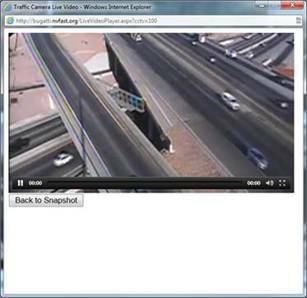 And the snapshot playback tool is used by NHP emergency responders to review and enhance their work at the scene, for example whether a lane is blocked unnecessarily. 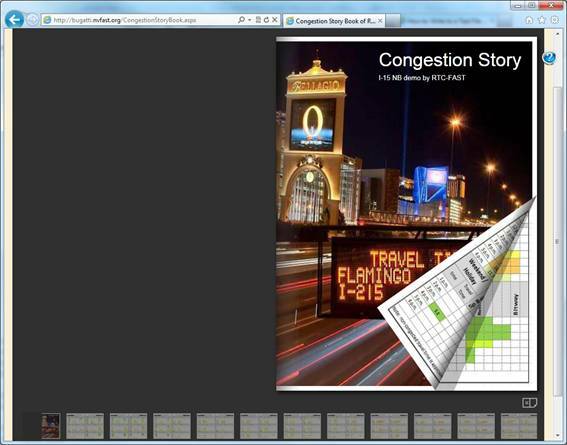 The two snapshots below are the Historical Traffic Animation and Snapshots Playback page. Traffic incident icons will fly-into the crash location one hour before its occurrence; flash during clearance; and fade as traffic queues dissipate. This function is also useful to identify secondary incidents. The camera snapshots playback function is only accessible to approved users. 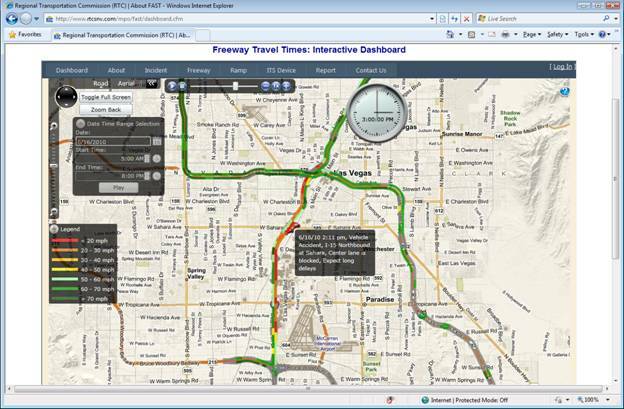 PMMS set up a series of nodes and divide Las Vegas Metropolitan freeways to corridors/sub-corridors, which helps traveler and professionals to follow specific freeway segments. · Similar dashboard shows the traffic condition of the specific corridor. · Measures include average speed, average lane volume, HOV or express lane speed and volume, general purpose lane speed and volume. · User can compare different months by selecting corresponding pages on the bottom. · Dashboard shows more unreliable and lower speeds of bottlenecks. 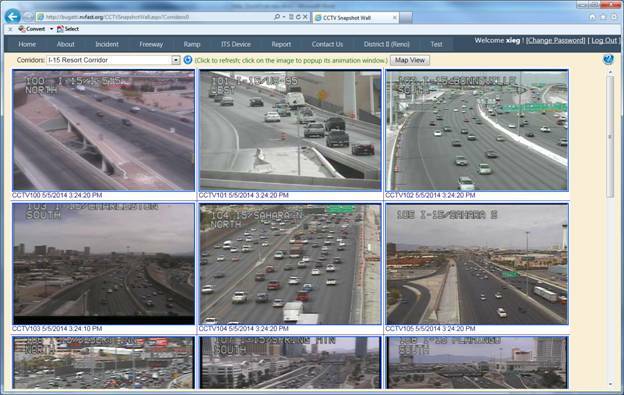 NDOT and FAST implement radar or loop detectors about 1/3 mile along the urban freeway in Las Vegas Metropolitan Area. 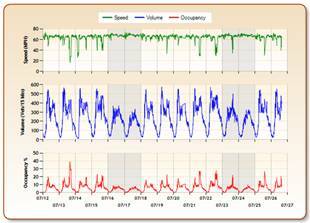 Detection data include traffic speed, volume, occupancy, and classified volumes by vehicle lengths, which are the major sources to monitor and evaluate the freeway performance. · Monitor detector health and Identify malfunctioning detectors, controllers and communications. 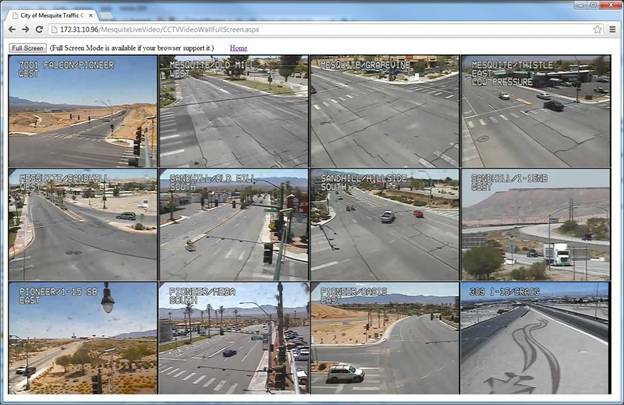 FAST operates over 400 cameras in Southern Nevada. The Dashboard not only has a camera map, but also this featured Camera Snapshot Wall page. 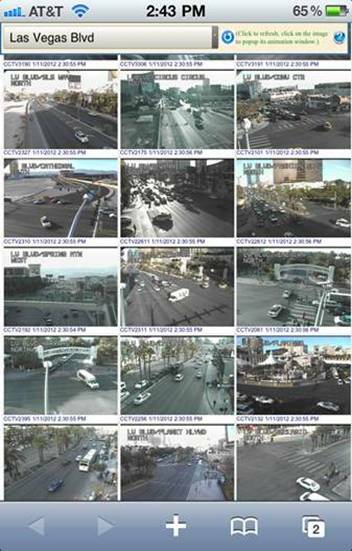 The cameras are grouped by freeways, corridors and area or by special events, like NASCAR, CES Show, Electric Daisy Carnival, UNLV Basketball or Football games. 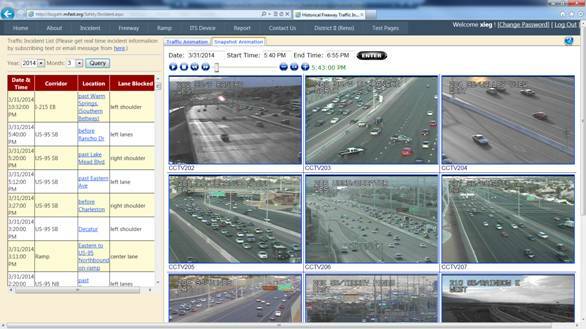 Users don’t need to click on the camera icon to show the snapshot one by one; the traffic condition along the whole corridor can be easily viewed at a glance in a few seconds. This feature is innovative and is not seen on other websites. The camera can be added to any group without adding extra processing power to the server. It is extensively used by radio traffic reporter and fleet dispatchers. It has a desktop viewer version and mobile version. It is like a mobile TMC screen wall in everybody’s hand. Users don’t need to install any app; they just need to type in the address http://bugatti.nvfast.org/CCTVSnapshotWall.aspx in the smart phone or tablet browser. It can be simply added it to the iPhone home screen and works like an app. When a user is interested in one of the cameras on the snapshot wall page, he/she can click on the camera and a popup window will update the snapshot every 5 seconds and provide “Live Video” capability. It will stream the video to the user’s browser. It works on all browsers and devices, desktop or mobile, Apple or Android. The beauty of this feature is that it doesn’t require extensive computing power to stream all the 400 cameras. It is on-demand streaming video. When the first user clicks on the “Live Video” button, it starts the streaming process. Additional use will extend the streaming video time. In reality, there are not many users streaming at the same time, so the dashboard only requires one server to handle all the streaming requests. Unlike traditional public systems that require an array of powerful servers to provide fewer CCTV images to a limited number of browsers, the FAST Dashboard’s on-demand method is the most cost-effective way to provide live streaming video for all cameras. Over 400 cameras snapshots are achieved at 5-minute interval, and can be animated using this Camera Snapshot Wall Animation page. User can customize the corridor, date and time period and playback speed. The FAST TMC currently displays travel times to 110 destinations on 42 DMSs, and the DMS messages are archived in the database. This function parses the messages and extracts the destinations and travel times from the messages, and stores them in the Dashboard database. Public can use this page to query historical travel times and analyze the 15% and 85% travel times so that they know their commuting route’s normal travel time and once-in-a-month longest travel time. This function has also been used by FAST TMC to verify the DMS travel time accuracy, especially when new DMSs are installed and start posting travel times. 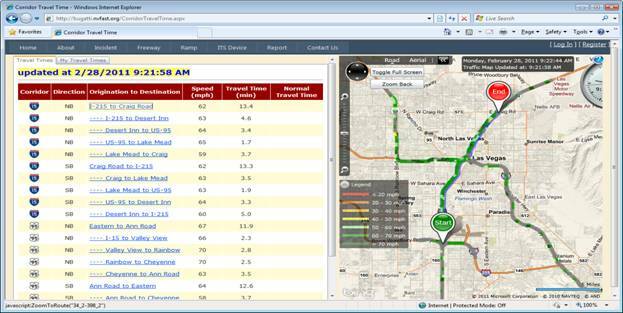 Corridor Travel Time page presents the speed and travel times of the system’s predefined routes and user defined routes. The travel times displayed on this page automatically update every minute. It can also query any OD-pair travel time on the fly. When a user selects a route, the route is highlighted and the origination and destination are pinned on the live traffic map, as shown in the screenshot below. The pins can also be dragged to any location on the segments when users create their own route. This function is used to verify FAST TMC DMS travel time postings. 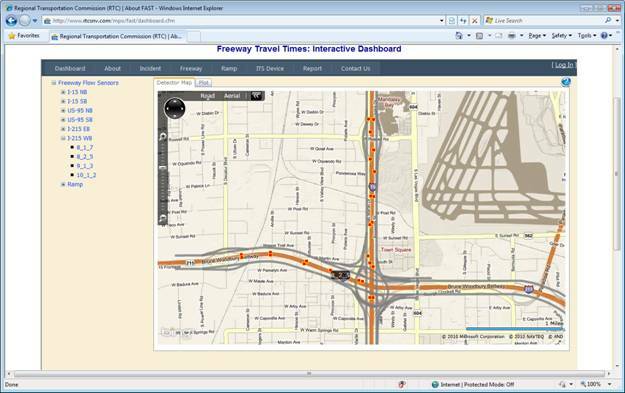 RTC transit planners also use this to get travel times when designing proposed transit route schedules. NDOT and FAST implement and operate ramp meters at major interchange on-ramps. Most of them are operating at traffic responsive mode from 6:00 to 9:00 AM and 1:30 to 6:00 PM. Ramp volumes are collected by video/loop detection around the stop bar. 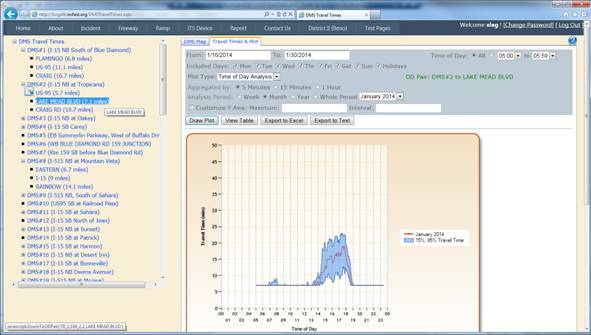 · Provide data for simulation and modeling input and validation, and for ramp meter design. 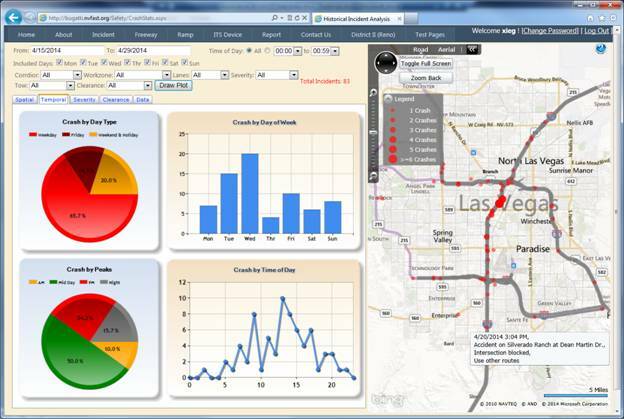 Since NDOT District II is using the same data format as Las Vegas area. 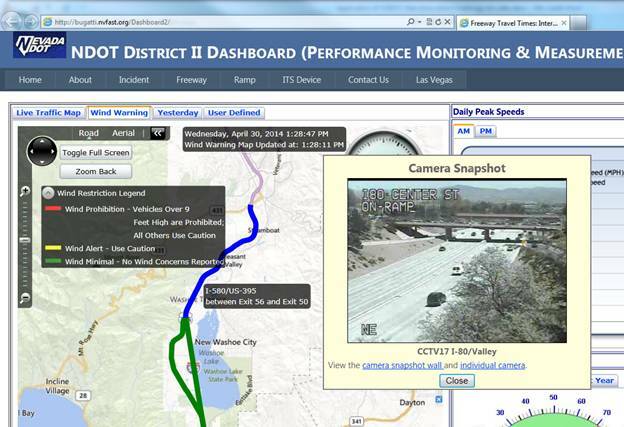 The FAST Dashboard has been easily migrated and deployed to NDOT District II. Besides that, a new feature, wind warning map is added to the home page. When wind speed is higher than a threshold, high profile vehicles are either advised to detour or drive with caution. 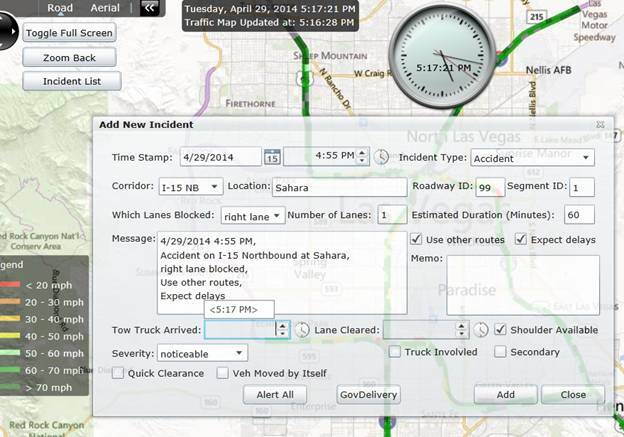 This feature is used by Reno school bus dispatchers, as well as transit dispatcher and NHP state highway troopers. 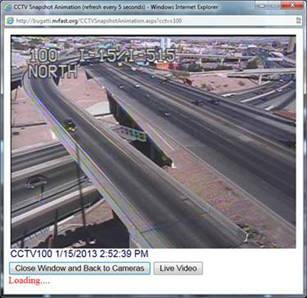 City of Mesquite is very interested in the streaming video feature of the FAST Dashboard. This feature has been deployed to City of Mesquite with minimum effort. The hosting server is a virtual machine that capable of streaming 12 videos. The streaming video is displayed in browser which can be viewed by full screen. It is being used at City of Mesquite Police Department and City Hall without any additional cost. 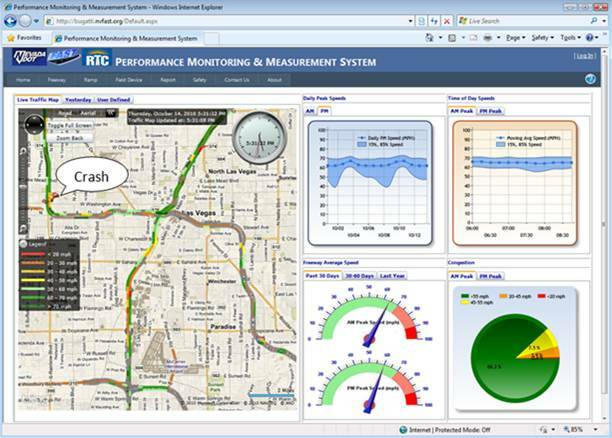 City of Mesquite has no TMC, with this system it can be used as TMC screen wall anywhere. Besides the live streaming video wall, these streaming video can also be viewed on Apple or Android mobile devices. The screenshot below shows it is being viewed on an iPhone. 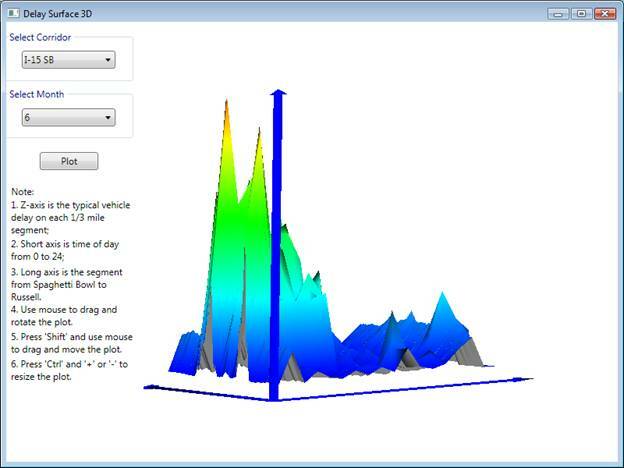 This interactive Vehicle Delay Surface 3D Plot is used to investigate typical vehicle delay on each 1/3 mile segment of a corridor from hour 0 to 24. By comparing the delay surface of different month, the freeway performance improvement can be easily observed. 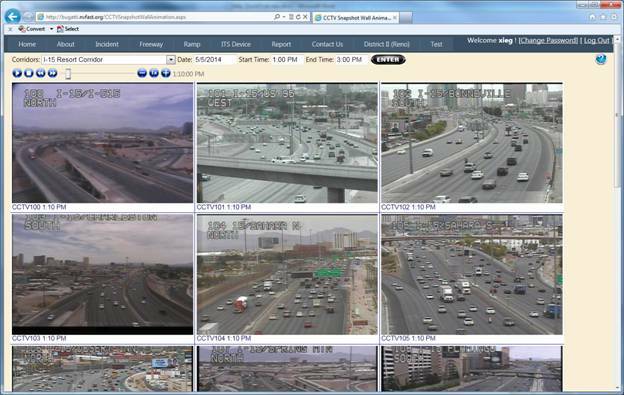 For example, I-15 Express Lanes were opened on 6/25/2010. By comparing the I-15 SB Delay Surface Plots of June and July, you can observe that delay has been reduced by 50% since the express lanes opened, and I-15 SB Sahara bottleneck is eliminated. · Long axis is the segment.